Alaska is a big place, but you don’t necessarily need a big bag of gear to make good photos. This is especially true if you’re on a cruise. This article is aimed at the serious, as in you care about your images, photographer going to Alaska on a regular cruise ship; not something like a Linblad or National Geographic Expedition. I’ll be outlining my thought process behind my recommendations, so you can better understand my thinking and whether you want to apply it to your own situation or try something different. Secondly, I won’t be covering compact, or point and shoot, style cameras, or smartphones. This isn’t to say that you can’t use those to make good pictures, even on a cruise in Alaska, just that I don’t have enough direct experience with these cameras to make specific recommendations. That said, if you will be using a compact camera, many of the broader topics I cover will still be applicable to you. Finally, if there’s one point that needs to be made, its that there’s no right or wrong platform, brand, or type of camera for this kind of thing. While I’m talking about my experiences, and I shoot full frame Canon gear, you can easily translate the focal lengths I give for what provides the same coverage on your platform of choice. To go along with this article, I’ve also written some more detailed articles on specific excursions and areas. 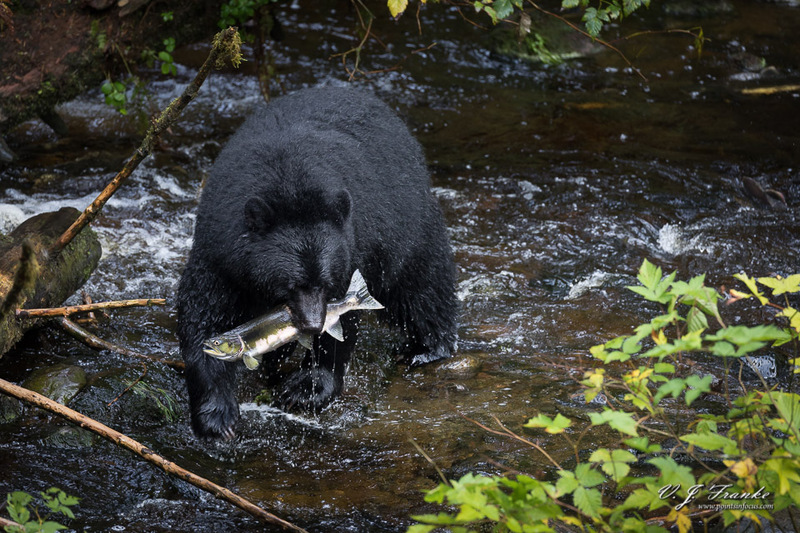 More detailed articles can be found starting with my Misty Fjords National Monument and Ketchikan article, as well as Black Bears of Revillagigedo Island, and my Alaska Humpback whale photography guide. Mount Crillon from the deck of the Norwegian Jewel in the Icy Strait. I’ve been traveling with camera gear for 4 years now, and one point that’s been driven home to me over and over again, is how weight makes or breaks a trip. Carrying less weight has always translated directly to a much better experience for me. Even if you’re in amazingly great shape, carrying around less weight in camera gear is going to make your days out more enjoyable. When it comes to cruises, on the ship itself, the weight of your gear really isn’t that important. However, unless you’re one of the lucky few that live in either Vancouver, Seattle, or the neighboring areas, getting to the cruise is going to involve flying. Moreover, many 7-day Alaska cruises are one way affairs, going from form Vancouver or Seattle to Seward, Alaska or vice versa. Besides travel to and from the cruise ports, you also have to consider what you might do for shore excursions at the various points of call. For many of these, weight, and bulk, will be a consideration you need to think about too. For example, flying on small bush planes, fitting your kit into loaded 4x4s, or hiking around towns. To pack light, you have to think about the light stuff, not just the heavy things. It’s very easy to say, “eh this just weights a couple of ounces it won’t make difference.” But do that for 10 things, and now you’ve added a couple extra pounds. Be selective of the gear you’re bringing, but don’t fail to bring something you’ll need. My point here is that you need to stay on top of weight when you’re packing. I would almost go so far as to say that you need to be absolutely brutal about it. That said, this is a balancing act. How much fat you need to cut is going to be different if you’re trekking in the Himalayas versus going on a cruise. Broadly speaking this comes down to a simple point, be selective of the gear you’re bringing, but don’t fail to bring something you’ll need. Ultimately you should have a good reason for everything you’re taking, and there should be few if any things that fall in the I’ll take this just in case category. Breaching Humpback whale from the deck of the Norwegian Jewel in the Chatham Strait. Of course, foresight isn’t prefect, and we can’t always know what we will or won’t use (which is part of why I’m writing these articles too). It’s inevitable that there will be extra stuff, the goal here though is to minimize that. Think as hard about the small things, as you do about the big heavy things. The best camera is the one you already know how to use. The short answer to the camera question is simple. The best camera to take is the one you already have and know. One point that’s been driven home to me with experience, is that familiarity with your gear cannot be underestimated. I’ve been in plenty of situations where I’ve been able to get a shot because I intuitively knew my camera’s controls or it’s performance envelope. When you know your camera, you know where the settings are when you need to change them, and can do it quickly when you need to. Perhaps more importantly, your experience with the camera should inform you of your camera’s limits. Specifically how far you can push it, and in what scenarios you just won’t be able to get anything good enough out of it and can just step back and admire the view. Shooting bears under a rainforest canopy, on an overcast day digs into the high ISO range. (1/320 f/8 ISO 2500). Fortunately, the vast majority of the photography you’ll be doing on an Alaskan cruise is a good fit for a generalists camera. That is, you’re not going to need to shoot at 10-20 FPS or risk missing the peak action. When I say a generalists’ camera, I’m talking about a camera that has a good blend of capabilities, frame rate, and resolution. Fortunately, that’s the vast majority of semi-modern DLSRs and mirrorless cameras, and even many compacts. That said, one performance aspect that was surprisingly more important than I would have expected it to do be, is noise at moderately-high ISOs. Southeast Alaska is known for rain, and with that comes overcast skies and not a whole lot of light. This isn’t so much of a problem if you’re just shooting landscapes, but when you’re shooting bears or whales, or anything that moves, where you need motion freezing shutter speeds, it’s very easy to end up shooting at ISO 3200-6400 or higher. On my trips, I shot with Canon’s EOS 5D series; a 5D mark III and later a 5D mark IV. These cameras gave me a good balance between resolution, 22 and 30 MP respectively, and frame rates, 6.5 and 7 FPS respectively. They both had solid AF systems, that could track things like eagles, whales, and bears. Finally, they could produce images that are acceptable to me at ISOs as high as 12,800 in the case of the 5D mark IV. Do you need gear that pro? Absolutely not. A good balance between FPS and resolution, the 20-30 MP range seems to be a good sweet spot for this. A reasonably good AF system with a 19 or more points in a reasonably dense grid. Decent moderately high ISO performance (1600-6400); this is especially important if you’re shooting with f/5.6 lenses. Multiple Bodies or Just one? Obviously going on an Alaskan cruise is expensive. In some respects, the cost of a second body to insure you have a backup to continue shooting with or to expand your capabilities is insignificant compared to the cost of the trip as a whole. On the other hand, it is an added cost; not only in dollars, but in weight. Should you take a second body? When it comes to having a second body, for me there are two ways to think about this; as a backup, or as a second working body. I consider a backup camera to be one that I don’t intend to use unless I absolutely have to. It’s there in case my main body fails, breaks, or gets lost or stolen. Since I don’t intend to really use the camera, I also don’t want it to contribute a ton of weight either. Therefore, I’ll strip off as many accessories as I can like battery grips or Really Right Stuff L-plates to cut down on the weight. On the other hand a second body is a camera I intend to shoot with regularly. Usually, the intent here is to have two different setups that you can very quickly switch between. You see this a lot with sports and wildlife photographers that need to be able to quickly react to changing circumstances. That said, the consequence of having a fully featured second body is weight. While you can cut the accessories off a backup, you’ll want to keep them on something you’re going to be using a lot. Take from a Small (30′) whale watching boat, handheld with a 100-400mm lens. With the definitions out of the way, do you need a second camera for an Alaskan cruise? As I said earlier, an Alaskan cruise for most people is hugely expensive and often a once in a lifetime thing. For me, that was enough to warrant bringing my other body just in case. The question is a bit more complicated if you only own one body. Certainly you can just take that and nothing else. The odds are good that you won’t have any problems with it and it’ll just work, and that’s certainly the cheapest and lightest option. In any event, I would suggest if you’re going to take a second camera, is that you try to stick to things with as much commonality as possible. Batteries are a big point here; dissimilar batteries require separate chargers and that adds up in terms of weight and things you have to keep track of. Right now, the sweet spot seems to be the middle of the range cameras from pretty much all of the camera makers. Either APS-C or full frame the middle of the road bodies seem to offer the best balance in resolution and FPS. Moreover, Nikon, Canon, Sony, and pretty much everybody else now include good AF systems with lots of points and good low light accuracy. Additionally, for both Canon and Nikon, the middle range seems to be the best bet for commonality between bodies across tiers. For example for Canon, everything from the 80D up to the 5Ds R all use the same batteries and chargers. A similar situation exists for Nikon, with everything from the D7000/D7500 to the D850. The lenses you want to use are in part always going to be dictated by your own personal vision and style; at least to a point. Because of that, I can offer some general tips and guidance, but I can’t say you for sure want to use lens X, Y, or Z. After two Alaska cruises, I’ve settled on really only needing 2 lenses: a good sized telephoto zoom (I use a 100-400), and a normal or general purpose range zoom (I use a 24-70). In practice, you can get away with even less than that. An 18-250 to 18-400 super zoom on an APS-C camera would even work to cover all of one’s bases. What I haven’t found especially useful is something in the ultra-wide angle range. I took one on my first trip, and never actually used it. 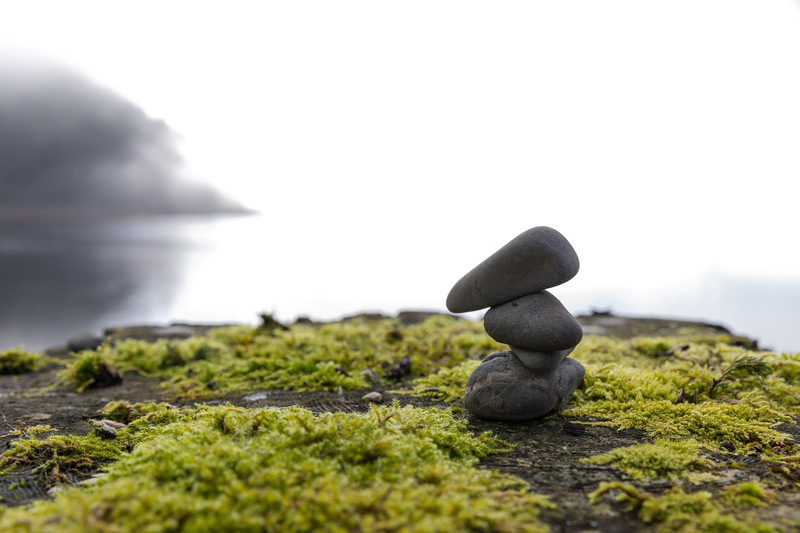 Stacked pebbles on a moss covered piling, shot with a 24-70mm lens on a 5D mark IV in Icy Strait Point. While there may be exceptions, I’ve never run into anything on an Alaskan cruise that really demanded an ultra-wide angle lens. 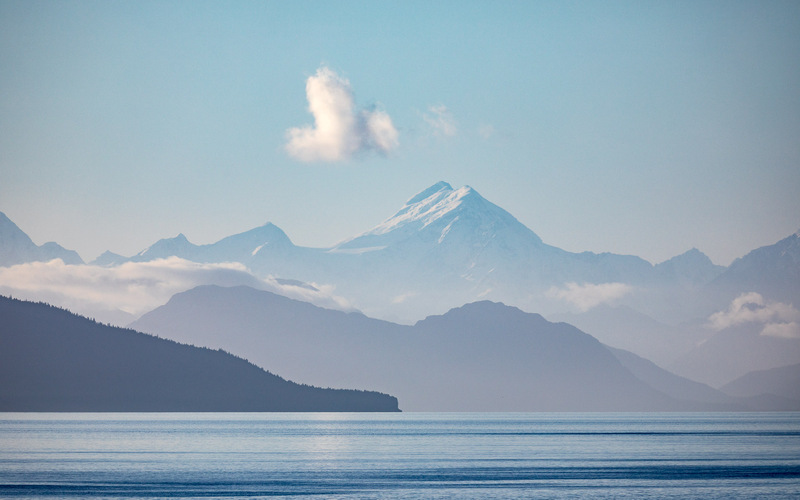 For shooting landscapes, like those in Glacier Bay, I’ve found the results from a stitched pano with a moderate telephoto focal length (like 70-100mm on full frame) produce much better images. Moreover, many of the landscapes are so large, that you can easily shoot panos handheld without having stitching issues. The landscapes in Alaska, at least the ones you can see from the boat, tend to very wide and either not very tall or valley shaped. Shooting with a wide enough lens to fit everything in the frame, results in having a lot of dead space in the sky and water and consequently not much resolution where the actual landscape is. Ultimately, on the wide angle end of things, I’ve found that going wider than a 24mm full frame equivalent angle of view lens isn’t really useful. On the other end of the spectrum, how much of a telephoto lens you’ll want or need is going to be dictated by how interested you are in taking pictures of wildlife, what kinds of wildlife you want to shoot, and where you’ll be shooting from. Johns Hopkins Glacier (Glacier Bay National Park) from the deck of the Norwegian Jewel. Stitched Pano shot with a 100-400mm. Shooting from the cruise ship you’ll want the longest lens you can get. But there’s a catch to that too, the ship moves deceptively quickly and vibrates; especially if you’re near the engines at the stern. A long lens, especially on a high resolution body, will magnify the motion and vibration dictating even higher shutter speeds to keep things sharp. For excursions, the situation is a lot more variable. 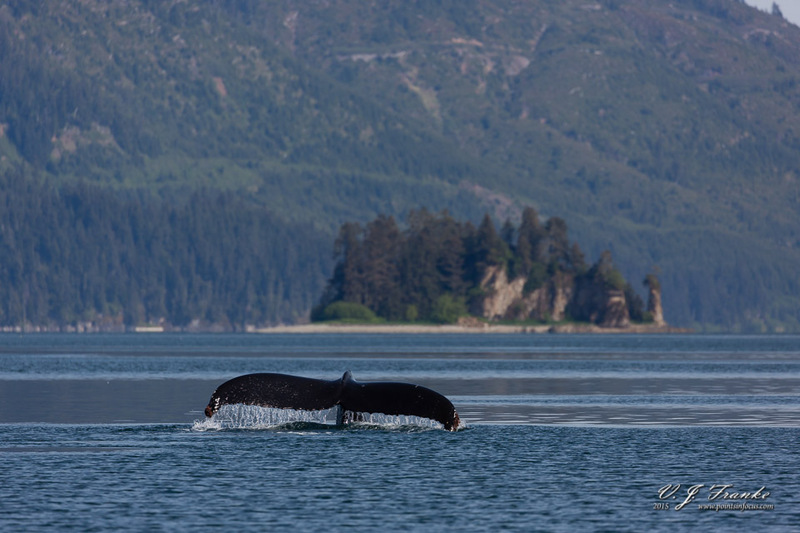 If you’re doing a whale watching excursion, you may want to check out my guide on photographing whales in southeast Alaska. I’m currently working on a similar guide for bears, but generally you have some more flexibility with that since you’re not usually on a boat. Ultra wide angle lenses aren’t that useful. A general purpose walk around zoom and a good telephoto are the most useful options. When it comes to choosing between a tripod, monopod, or nothing, my opinions have changed over time. For a long time, I found that image stabilization was enough on its own and I didn’t really need a camera support to get sharp images. As I moved to higher resolution cameras, and heavier lenses, I found that while IS helped, it wasn’t nearly as effective it was on my old 10 MP class gear. When I replaced my 100-400 with Canon’s mark II version, and gained the added weight that came with that, I stated using a monopod a lot more. In no small part, this was just to support the weight of the lens to keep me on target without killing my arms. That said, one of the biggest shortcomings of monopods is that they don’t stand on their own; at least mine don’t. As a result, its difficult to do things that require both hands away from the camera without finding a place to put the camera down. On my first Alaska cruise, I left the tripod at home and only took a monopod. My reasoning was that the boat would probably move and vibrate and the tripod would conduct that vibration to the camera. Having a forward cabin, this proved not to be a problem. On the other hand, having to constantly hold the monopod, then set it down where nobody would trip over it, then pick it up again became quite an annoyance. On my second trip, I took the tripod, and was vastly happier as a result. In fact, I almost never used the monopod on that trip at all. Shooting from our room’s balcony, I mostly kept the camera on the tripod if I was going to be shooting for any length of time. On excursions, I shot almost entirely handheld, as a monopod (and especially tripod) would get in the way on a small boat or just be something extra to lug around. The necessity of a camera support depends on the weight of your gear and your comfort holding it. Monopods aren’t that useful on most excursions. A tripod can be handy for shooting from your stateroom’s balcony. Southeast Alaska is known for its rain and generally poor weather. Because of the weather, I’d strongly recommend bringing rain gear for your camera. For rain gear, I took both my ThinkTank Hydrpohobia 70-200 and some disposable OpTech USA camera covers. 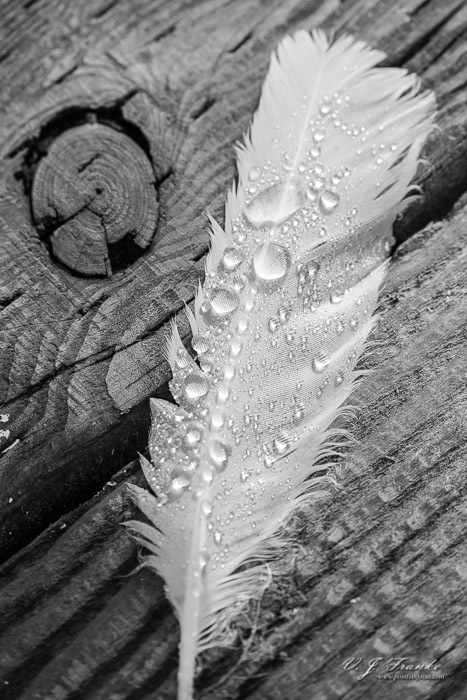 Though ultimately I ended up relying a lot on the weather resistance of my camera and lenses, as sometimes it was simply impossible to put a rain cover on fast enough to stop the camera from getting soaked. On the topic of rain covers, I’m also currently testing the Ruggard RC-FC500B which is a much lighter weight alternative to the ThinkTank Hydrophobia I liked above. It’s lighter, and uses thinner material, so it may not last as long in the long run, but it’s much more packable and somewhat easier to throw on the camera quickly. 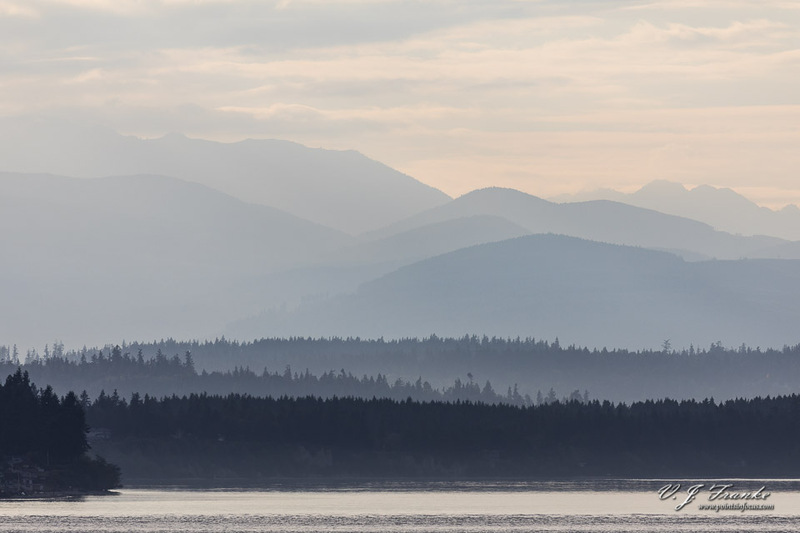 The coastal range and islands of western Puget Sound from the deck of the Norwegian Jewel. In a similar vein, I’ve never found a compelling need for a flash on an Alaskan cruise. I took one on the first trip, and never used it. The second time, I left it home and never ran into a situation where I wished I had it. If your camera has a built in pop-up flash, then that’s an idea compromise. Dialed in to -2 Ev, they’ll provide a nice fill light for indoor pictures, but they won’t weigh you down. For those of us with cameras that lack popup flashes, consider the smaller “consumer” flashes like Canon’s Speedlight EL100 or 270Ex, or even the ultra-compact Speedlight 90Ex. Nikon’s options are a bit more limited, namely there’s the SB 300. Finally there’s some 3rd party options in the same small sizes that would be worth considering as well. As with most things, there’s a whole lot more to consider than what I’ve covered here. Details will obviously vary from photographer to photographer depending on your specific kit and vision. Though I hope I’ve laid out some broad strokes that can be useful for starting to plan around if you’re a serious photographer going on a regular Alaskan cruise. If you’ve got a question, leave a comment below and I’ll try to answer it. 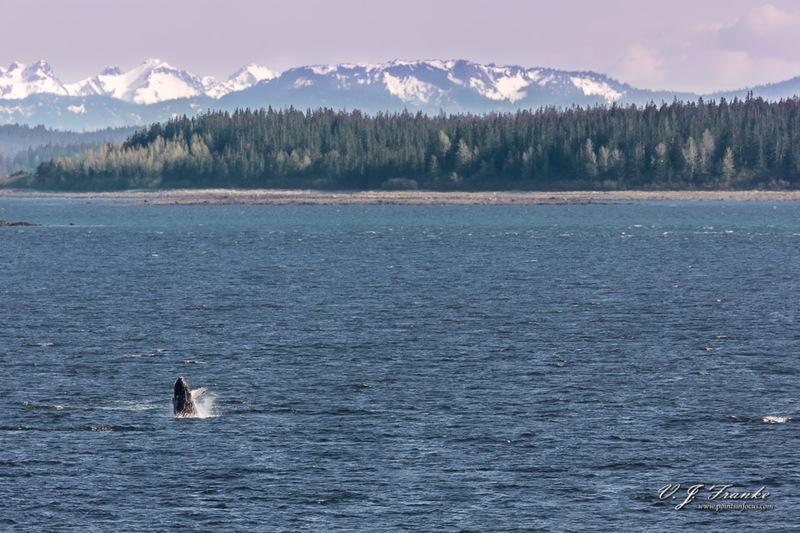 If you found this post useful, and are heading to Alaska on a cruise, I have a number of articles detailing specific shore excursions, like my guide to photographing humpback whales, or the White Pass and Yukon Route railroad. Or just jump to the full list of my Alaska travel and photography articles. We are planning a non cruise trip to Alaska. I plan to take my 70-300 mm lens but wondered if I should invest in a newer, better telefoto lens for my Canon DSLR. Between the 24-105 mm and or 18-135 mm lenses would one be preferable based on your trips? I don’t want to carry too much weight because we will be hiking some but definitely want to have what I need. I enjoyed reading your blog post and would appreciate any help that you are able to give me. Re., your 70-300, the first question on that is which one do you have, with a very close second being are you happy with the images you get or do you find them a bit lacking in sharpness/resolution/detail? Canon alone currently has 4- 70-300s (6 if you count the 75-300) in their product line, and that doesn’t count the 3rd parties. Moreover, that problem gets somewhat tricky as, aside from the EF 70-300mm f/4-5.6L IS USM, they don’t tend to be consistently good or bad through their zoom range. Honestly, I’m not really sure what I’d do in your situation. A lot of that has to do with personal preferences too. About the best I can say, is if you’re not satisfied with the sharpness/detail you get out of your existing 70-300, then it’s probably worth considering upgrading. However, to the best of my knowledge, the only consistently good 70-300 is the Canon EF 70-300mm f/4-5.6L IS USM, and that’s a $1300 lens (~$1000 if you go with a Canon factory refurb). Re. choosing between a 24-105 and 18-135. While you didn’t mention what camera you have, since you have a 18-135, I’m going to assume it’s a crop body like an 80D or Rebel. On a crop body, I think my choice would easily be for the 18-135, at least assuming that you have a USM or STM version and not the original version. Image quality on Canon USM and STM versions, is reasonably on par with the 24-105 f/4L first gen, and usually better than the 24-105 f/3.5-5.6. Plus it has a wider working range, especially the at the wide angle end where the 24-105 really isn’t that wide-angle. Hope this helps a little, if you have further questions feel free to comment, or if you would like to take the discussion to email, you can use the contact to send me an email, and I’ll reply to you directly. Also I hope you have a wonderful trip and get lots of great images. My girlfriend and I are going on a cruise/land tour, cruising from Vancouver to Seward on the NCL Jewel, followed by a land tour. I was hoping you could give me some advice on what photo gear to bring, or more appropriately what gear to leave at home. My camera is a Canon 5D Mk III, which I will be bringing. I have a Canon 16-35 mm which will be staying home. My go to lenses are a Tamron SP 24-70 f2.8 and a Canon 70-200mm f/2.8L IS II. Recently I purchased a Tamron 28-300 f3.5/6.3. I’m trying to decide between the trade off of a single, lower weight lens vs. the higher quality of the two f2.8 lenses. I also have the first generation Tamron 150-600 f5-6.3 along with a Kenko 2x. It’s tempting to just take the Tamron 28-300 and the 2x. The decreased weight of those two lenses are very tempting but I’d hate to get home and be disappointed because of the speed/quality of the lenses. First off, I was on the NCL Jewel for my cruises, and I really liked the ship. I felt it was just the right size for Alaska, small enough to get in and up close to the glaciers, yet not so big that you were fighting 5000 people were trying to get off at each port. As for the gear, so much of what you’re asking really depends on what you consider acceptable in terms of image quality. For example, I wouldn’t bother with the Kenko TC, my experiences with their TCs have been pretty bad, and when you’re using a 2x that really hurts things. Moreover, TCs, especially 2x TCs, really demand the best glass you can put in front of them, and there will still be a noticeable lost in image quality. Consequently, I have a hard time thinking that an already slow 28-300 stacked on top of a Kenko TC would really be a good idea. Plus your AF is shot outside of live view, and ultimately we’re talking about an f/11 aperture which is going to hurt shutter speeds when you need them most). Given my interests in wildlife I would probably want to take the 150-600. My experience on whale watching trips and shooting bears has been that 300mm isn’t quite long enough. Of course, if wildlife isn’t really your thing, then I’d leave it at home. The hard question is 24-70+70-200 vs 28-300. Personally, I’d probably take the added weight of the two higher quality lenses just because of the image quality. While I’m big on keeping weight down, I’m more willing to compromise on weight than on image quality. Plus that’s about the size of my normal kit (24-70 + 100-400) for a lot of trips, and I don’t find that too heavy. You’re on the right track though. My first trip I had a 16-35/2.8, a 24-70/2.8, a 24-105/4, a 100-400, a flash and two bodies in my backpack, and that was way overkill. The second trip I did with the 24-70 and the 100-400 and I felt that gave me just about the right amount of capabilities and weight to be happy. Hi Jason, Considering my gear for spring Alaska cruise and trip to Denali. Is it worth taking both the 70-300L and the Sigma 150-600? Camera supports: monopod, tripod and/or bean bag? With respect to your lens question, I would say if you can spare the weight and room take both. I haven’t been to Denali, but if it’s anything like Yellowstone when it comes to wildlife, you’ll want the 600’s reach. For most stuff on the cruise, you can probably get away with the 70-300, especially if you’re using an APS-C camera. One nice thing about a cruise is that you can be a little more judicious with the weight of your gear since you can leave stuff in your room. Take both, and only take the lens that makes the most sense for the day with you on that day. For camera supports, as I said in the article, I only took a monopod on my first cruise, and I found it got in my way more than it ever helped. I took a tripod the second time around, and was much happier. At the time I didn’t have a convertible tripod, like my Benro FTA28CC, in a lot of ways I would consider this to be the most ideal solution. As for a beanbag, I’ve never been a big beanbag user, so I couldn’t really say. It might be more useful in Denali than on the ship or the ship’s excursions, but again not having been to Denali yet, I don’t know. Alaska cruise coming up in July. I have a Canon 80D. I’ll be renting a telephoto lens for nature/wildlife shots from a local shop. Choices are a “SIGMA 150-600MM F/5-6.3 DG OS HSM CONTEMPORARY LENS FOR CANON” or a “CANON EF 100-400MM 4.5-5.6L IS II”. Which would be your choice? Given my experience, I’d go with the 100-400. When I was on my cruises, I found that I never felt really pressed for more than 500-600mm on a full frame camera (basically a 100-400 with a 1.4x TC). On your 80D, you get that angle of view form a 400mm lens. On the other side of the zoom range through, there were a number of times where I would be shooting all the way back at 100mm. In fact, on one whale watching trip, I missed a number of shots of a feeding whale because I had a teleconverter on my lens and couldn’t zoom out wide enough to get it all in. Also something to consider, your 80D’s AF system will focus at f/8. If you’re really concerned about not having enough reach, you can rent a Canon 1.4x III TC and keep it in your bag. It’ll give you a 140-560mm lens, for less weight than the Sigma. Taking the Jewel cruise (Vancouver to Seward) in June. I have a Sony A9, the 16-35 f4, the 24-70 f2.8, and the 70-300. Unfortunately the Sony TCs do not work with the 70-300. While a 100-400 would be nice, the weight savings is significant. Right now, I am thinking the 24-70 and the 70-300. Have also considered buying the 24-105 f4 and taking that instead of the 24-70, since I don’t plan on taking many photos inside the ship, so the f2.8 is not as big of a concern. Do you think I would be missing out on anything? On the short end, I never shot inside the ship either (out side of some shots of our room, which I was fine doing at higher ISOs anyway). Moreover, if you’re not shooting “fine art” stuff in the ship (e.g. family keepsake/memory images), then f/4 and a bit more ISO is fine for that. On the long end, looking through my images, I have a lot that I ended up shooting between 301 and 560 mm. In a lot of cases on the wider end of that (300-350 mm), I would have been fine if the range stopped at 300, but there were a number of images that I shot that needed all the lens I could get. One way or another, in going back and looking, most of the images in this article were shot at >350 mm. That said, it really depends on what you’re going after and how your “eye” composes the images. For whale watching, I think 300 mm would be fine — most of my whale stuff, is less than 400mm. 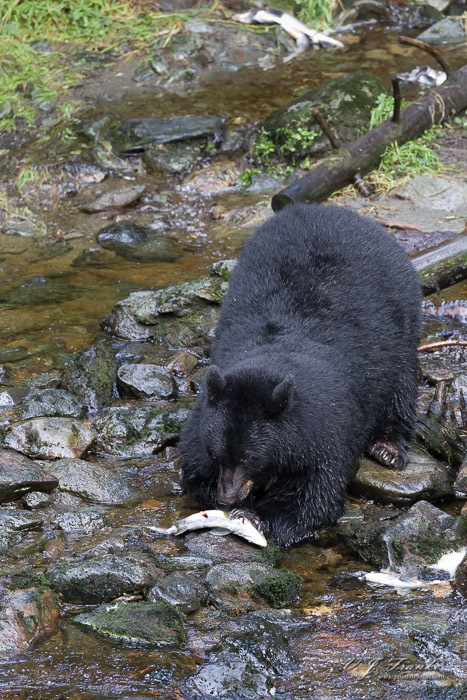 If you’re doing bear tours, it’s going to vary widely with the port and tour. Some you’ll be okay at 300mm; in other cases, even 1200mm wouldn’t be enough. If wildlife, especially bears, is an objective for you, I think you’d be better off buying/renting the 100-400 and a TC and taking the 24-70 you have. If you’re not going to go after bears, or are happy cropping more, then the 70-300 would be ok (it’s a tough call though, as there’s a big personal taste/preference factor). Personally, I probably wouldn’t buy the 24-105/4 just for Alaska unless I already was thinking about getting it anyway. That’s probably not as clear of an answer as you were looking for, but I hope it helps some. Feel free to reply further if you have any more questions. Main reason I gave the 24-105 a thought was having some overlap on focal length. I have shot whales a number of times on Maui, and agree 300 is long enough. At my age (70), I am not sure I want to handle a 3 pound lens. LOL. So I think I will stick with the 70-300, which I really do like my nice sharp copy. Thanks for the input and your articles, which I found very informative for our particular trip. Given your situation, I think the 70-300 is probably the better choice. You can always crop some anyway. Re. the 24-105. I took one the first trip, and the extra reach was certainly useful over a 24-70. Subsequently, I don’t use mine as much, but that comes down to Canon’s first gen design not really providing the resolution I want to see on my cameras; which isn’t a problem that affects you. If buying one isn’t a problem, and given your situation re. the 100-400, then I see no reason not to. You save something like 9 ounces and get a good bit more extra reach without having to switch lenses. Going on a cruisetour in July and wanted to see your advice on equip. Primary interests are wildlife and landscapes. I currently have a 5d mark ii with 17-40L f4, and 24-105. Am thinking I’ll try to get a 100-400L IS (older version) for around $600-700. Question – also considering a new 7d mark ii instead of the 5d. Wondering if the extra length from the crop sensor when using the 100-400 lens is worth the trade off vs full frame? Or could take both cameras and leave 24-105 on the 5d? Regarding the 7D mark II, versus the 5D mark II. I think the 7D2 is a significantly better choice for wildlife all things considered. To start with for wildlife, the 3.9 FPS frame rate and antiquated AF system in the 5D2 is going to be a hindrance. If you look at the video clips in the behavior section (linked) of my humpback whale photography article, they’re played back in real time from a 6.5-7 FPS camera. There’s a lot to miss going down to 4 FPS, where the 7D2 is a 10 FPS camera so you’ll have better chances of getting a really good frame. Moreover, in in addition to the extra reach the center AF point on the 7D2 will work with the 100-400 (mark 1 or 2) and a 1.4x TC (mark 2 or 3). So not only do you get a 640mm equiv angle of view out of the box, but you can get 40% more if you have an extender too. Looking at the performance data, the 24-105/4 on the 5D2 will produce better images than the 17-40/4 on the 7D2. However, the 7D2 will be a better option for wildlife with the 100-400 given the better AF system and FPS. Honestly, I don’t really see a huge problem with taking both. If you’re not running battery grips and L-plates, neither of those bodies are unreasonably heavy, so the cost in weight of carrying both isn’t going to be horrible. They also use the same batteries, so you don’t need separate charging infrastructure either (which was a real pain for me when I was using a 1D and a 5D). Plus having 2 bodies does give you a backup if one happens to fail. One thing, with the first gen 100-400, make sure that you have a rain cover for it. Either the ThinkTank or Ruggard ones linked in the article should work well enough. The first gen 100-400s are not designed to be weather resistant, and you really don’t want to get them wet. Hope that helps. Feel free to reply back if you have any further questions or comments. Thanks for the quick reply and the good info. Much appreciated!